As a researcher, how do you evaluate whether the journal you’re about to send your work to is the real deal? The answer could lie in “Think. Check. Submit.”, an initiative launched by a coalition of publishers and industry organizations, which provides tools to make the process of choosing the right journal for your work simpler. With over 1,000 new academic titles launched in 2014 alone, deciding whether or not a journal is worthy of your work is increasingly difficult. Early career researchers can find it particularly hard to navigate a constantly changing landscape – and one that is almost totally unfamiliar to senior colleagues. Having more choice is generally a good thing, but the profusion of new titles, especially online, has also led to a rise in what some in the publishing industry refer to as ‘predatory publishing’. Put simply, ‘predatory’ journals trade, intentionally and fraudulently, off existing society or journal names. Authors send their work and, in some cases, pay publication fees to ‘predatory’ titles in good faith – only to discover that their research hasn’t appeared in the title they thought it would. The Think. Check. Submit. campaign empowers authors to evaluate the trustworthiness of a journal or its publisher. By using the simple checklist provided on the Think. Check. Submit. 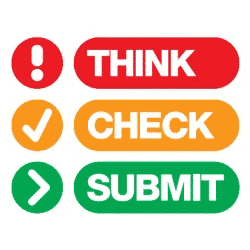 website (thinkchecksubmit.org), authors can make an informed choice before sending their articles for review. The checklist includes ways to evaluate the credentials of any title and the society or publisher behind it. It doesn’t offer a definitive list of ‘approved’ titles, but it is another important resource that authors can draw on – including their colleagues and information specialists – to make sure the research they publish has maximum impact on their careers.